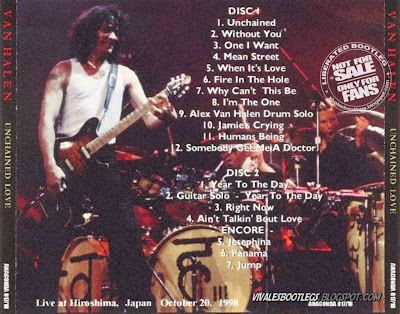 Recorded Live at Hiroshima Sun Plaza , Hiroshima , Japan - October 20, 1998. Files: 19.:: Size: 659.90 MB (flac). Personnel: Eddie Van Halen, Alex Van Halen, Michael Anthony, Gary Cherone. Notes: Cover has 4 individual pics with Mike, Ed, Gary, and Al behind the red VH swirl logo. The name "Van Halen" is written in yellow letters over the swirl logo. Sound quality is great - either a soundboard recording or an excellent audience recording!..<Info taken fron vhboots dot com>.